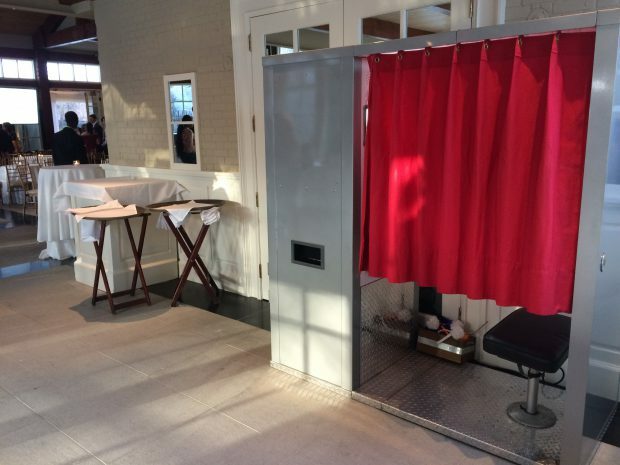 Our open-air photo booth option: the “Bellows Booth” is modeled after the old-fashioned cameras of yesteryear. Hand-crafted from maple and cherry, the elegant design of the Bellows Booth will enhance the decor of your event and delight guests. It truly is a work of art. After posing for three photos in front of a back-drop of your choosing, two identical strips of high-quality, glossy photos (black and white or color, and customizable to include text) are printed out. Guests take one as a favor and we keep the other for a “photo guest book” which is assembled on-site for you by our attendant. 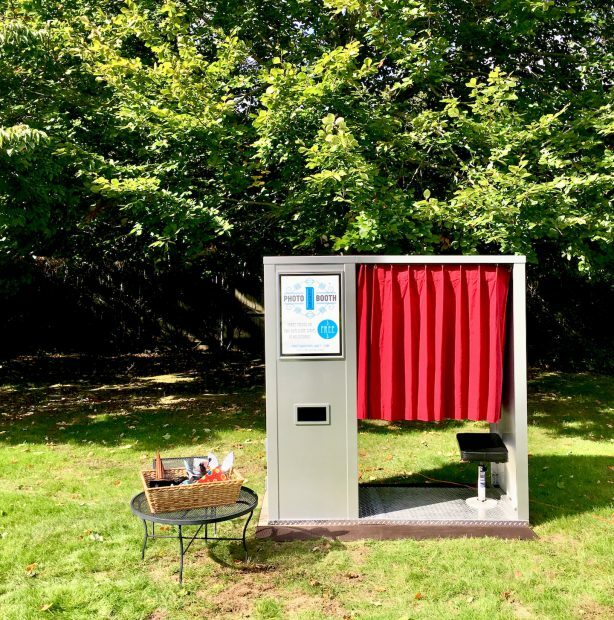 This open air photo booth option is available in Rhode Island, Connecticut, and Massachusetts. 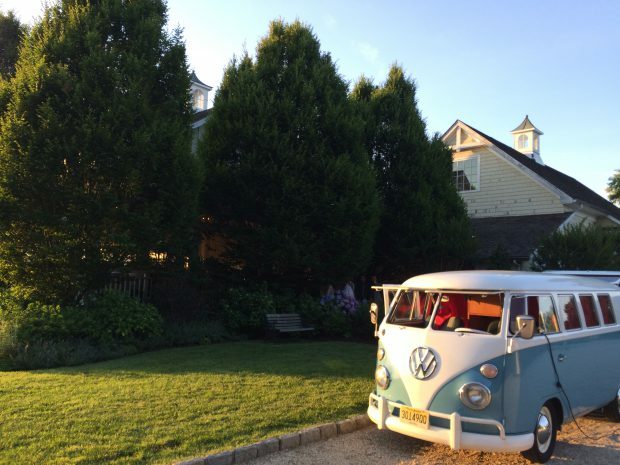 Recently visited Long Island with our VW Bus at the Bedell Cellars Winery on Long Island. 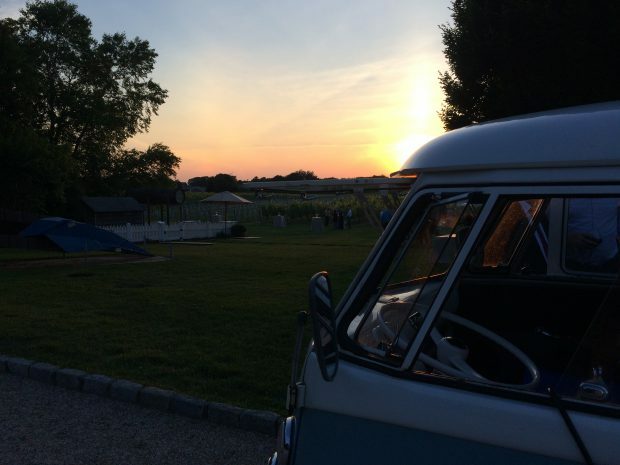 Captured this shot of our VW Bus overlooking the vineyard at sunset. Our VW Bus was positioned perfectly for guests to access the photo booth. Big thank you to Riva and the wonderful Bedell Cellars staff for their hospitality. One of the coolest places on Long Island for a wedding! If you get a chance, check out the North Fork of Long Island. You will find a wonderful selection of wineries in New York’s backyard. Check out this blog post from Winepair. We loved being out there and interacting with the local wineries. Bedell Cellars is one of many we highly recommend! Took this photo at sunset last night at a picturesque North Fork Long Island Wedding. We partnered with Bedell Cellars Winery in celebrating a lovely wedding. Guest loved the beautiful view as well as our VW Photo Booth Bus! If you’re looking for great wedding venues on the North Fork of Long Island, check out our friends at Bedell Cellars. 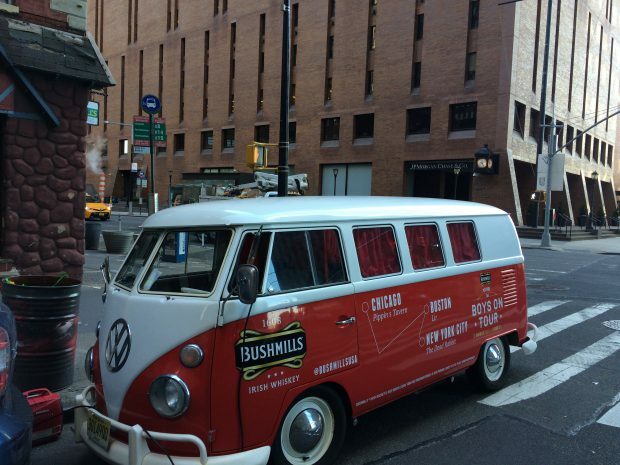 Last month, Bushmills Irish Whiskey, in partnership with one of NYC’s premier bars, The Dead Rabbit of NYC, hired our classic VW Photo Bus, Bella, to be part of their multi-city “Boys On Tour” St. Patrick’s Day events to demonstrate how to have a Real Irish St. Patrick’s Day. Each event, hosted at classic Irish bars featured innovative Bushmills cocktails, great food, and great music. Our Classic VW Photo Bus also offered guests the opportunity to jump in the back and take a few free photos to commemorate St. Patrick’s Day 2018! For this particular project, Print Structures of NYC utilized a specific vinyl wrap to transform our VW Bus from an ocean blue to a rose red outfitted with Bushmills branding. Print Structures vinyl wrap specialists, Jesse and Sage, labored for hours, ensuring every last detail of the VW Bus matched the exact designs of the graphic artists. Before my eyes, Bella took on a whole new persona, and she now embodied everything Bushmills upon completion. Kudos two these two exceptional artists and their commitment to their craft. 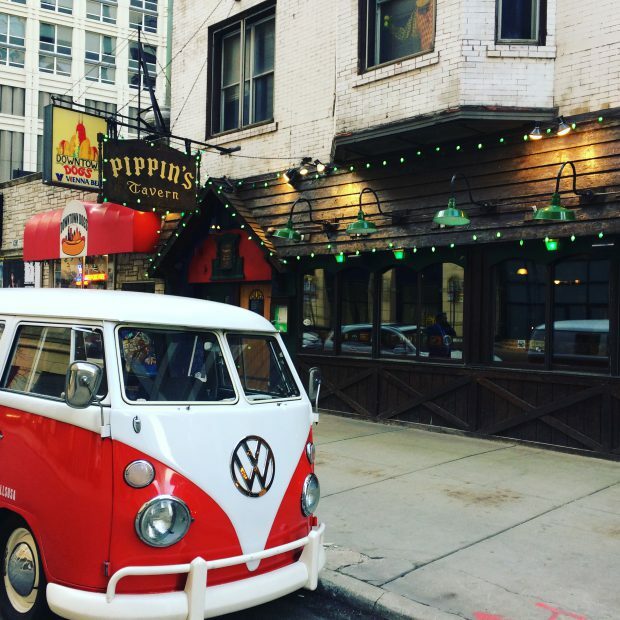 Our VW Bus parked outside Pippins Tavern in downtown Chicago. 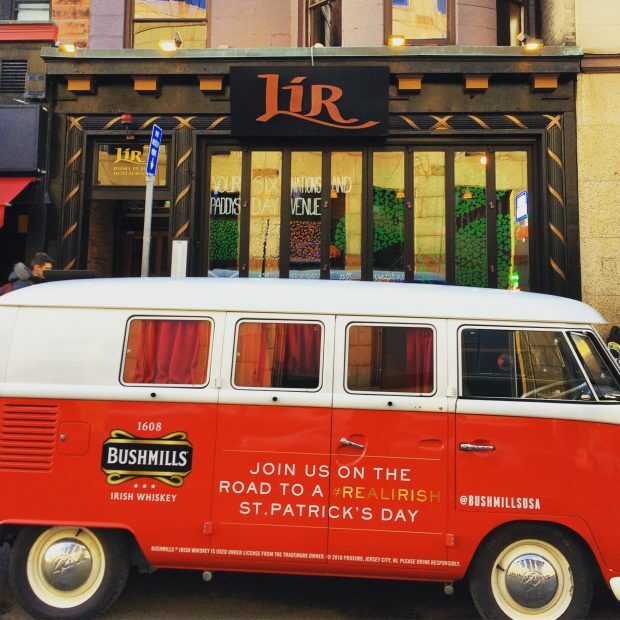 Our VW Bus parked in downtown Boston on Boylston Street in front of LIR on Boylston – great bar! 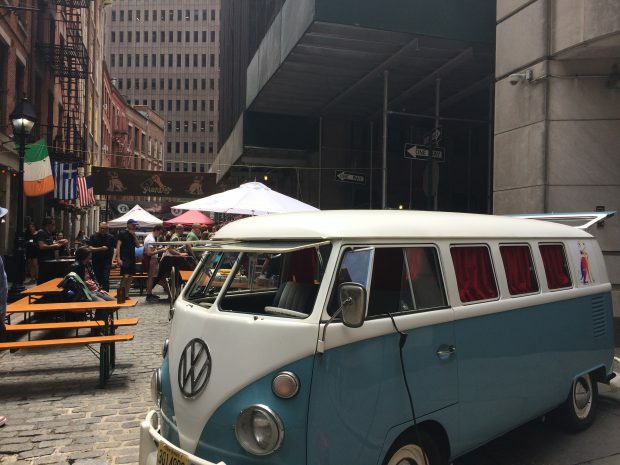 Our VW Bus parked in downtown Manhattan right around the corner from The Dead Rabbit. We had an excellent time promoting an authentic VW Bus Irish St. Patrick’s day, while also touring the country in our VW Photo Booth bus. Having travelled two thousand miles in one week, Bella, our classic VW Photo Booth Bus, is ready for another road trip to promote your next corporate event! 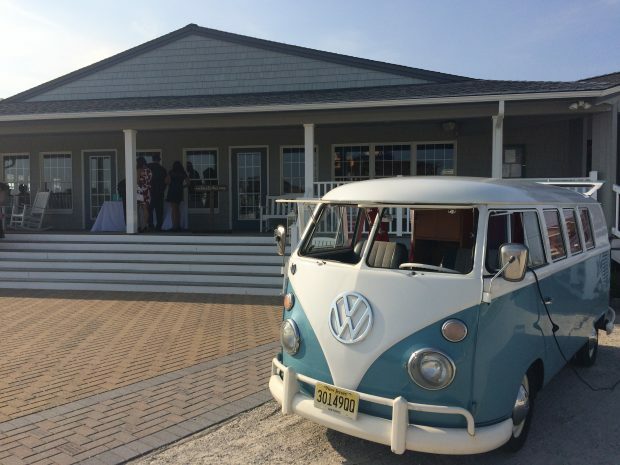 Last fall, the Tarrytown Music Hall invited our Classic VW Bus to join their 1960’s-themed fundraiser. We were happy to learn more about this venue. Part of being a small business allows us to learn more about our community and support other local efforts in the Metro New York City area. We are especially big supporters of all local artists, musicians, writers, and film makers. Built in 1885, the Tarrytown Music Hall holds an important place in American history. Originally, the venue served as a place for wealthy families such as the Rockefellers and Vanderbilts to attend local events. Later on, this venue hosted some of the world’s most talented musicians. Among the first artists to perform here, Antonin Dvorak and Hungarian pianist Rafael Jossefy. Later artists include Dave Brubeck, Louis Armstrong, BB King, Wynton Marsalis, Norah Jones, and many other talented musicians. 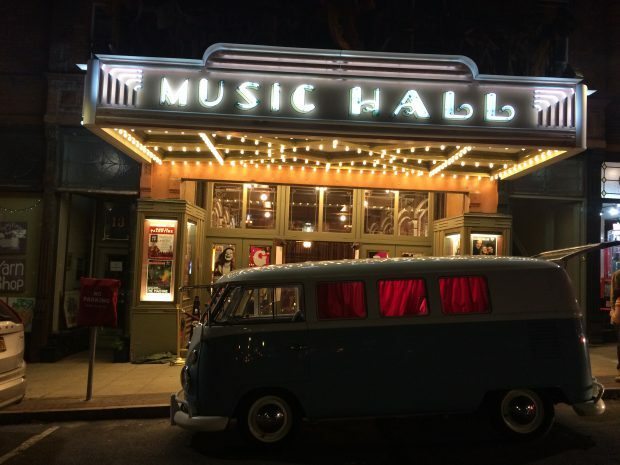 We parked our classic VW Bus in front of the Music Hall and invited the entire community of Tarrytown to take photos in the back seat. This gave us a great opportunity to start conversation, and direct community members to learn more about the Music Hall. A creative, fun-filled way to support local community organizations with our classic VW Photo Bus. To learn more about this historic venue, check out the http://tarrytownmusichall.org/history/ . If you would like to contribute to this historic venue and continue the legacy of arts and music in the Tarrytown and Hudson Valley area, follow this link to donate. Last year, several of us from Photobooth Planet attended the world’s largest Photo Booth trade show in Vegas learning from other photo booth experts, industry leaders, and business owners. We also walked through the exhibit floor, observing the wide variety of new camera technology and photo booth designs available for weddings, events, and corporate parties. Amidst the constant flood of new photo booth technology and innovations, it was easy to get caught up in the hype of new tools – robots and mirror booths are two examples. With the current pace of innovation, any seemingly great idea can be made obsolete in a couple years. So we asked ourselves: what made the original photo booth so popular on boardwalks, movie theaters, and five-and-dimes? While innovators constantly worked on refining and improving the photo booth itself, at some point, they all landed on the final design of an enclosed booth, a curtain, a simple camera, and excellent quality photo prints. As we receive many inquiries for different types of photo booths, our approach is pretty much the same. Keep it simple, and keep it timeless. Our vintage, classic photo booth has a minimalist design, classic construction, with excellent camera technology ideal for “attention-to-detail” weddings in Mystic (Saltwater Farm Vineyard, Jonthan Edwards Winery, The Mystic Seaport), Hartford (Bond Ballroom), Fairfield County, or anywhere else in Connecticut where people are getting married. While innovation remains key for any business model, in this age of instant technology, finding an updated, yet vintage design can set your event apart. We find that our photo booth bridges generational gaps, appealing to both the old-fashion, pre-internet generation and the tech-savvy generations as well. 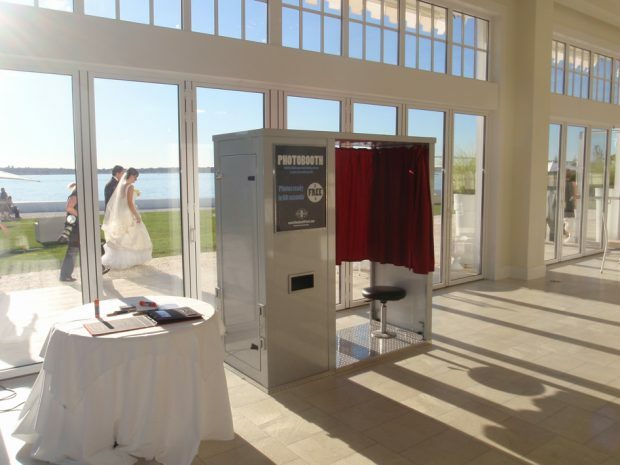 As you research your photo booth options, we highly recommend our classic photo booth – simple, elegant, timeless. Classic Photo Booth – Authentic, Nostalgic, Lovely. Last year, several of us from Photobooth Planet attended the world’s largest Photo Booth trade show in Vegas learning from other photo booth experts, industry leaders, and business owners. We also walked through the exhibit floor, observing the wide variety of new camera technology and photo booth designs available for weddings, events, and corporate parties. 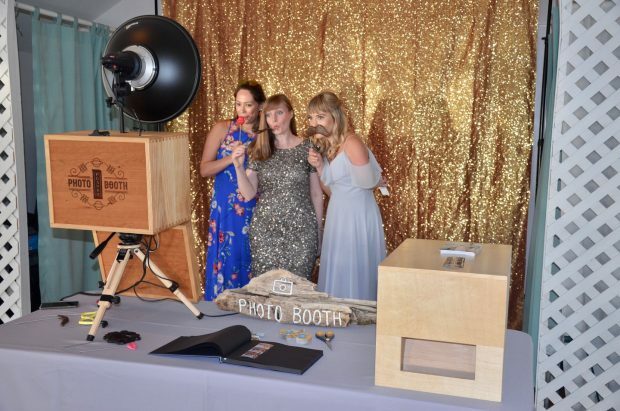 Amidst the constant flood of new photo booth technology and innovations, it was easy to get caught up in the hype of new tools – robots and mirror booths are two examples. With the current pace of innovation, any seemingly great idea can be made obsolete in a couple years. So we asked ourselves: what made the original photo booth so popular on boardwalks, movie theaters, and five-and-dimes? While innovators constantly worked on refining and improving the photo booth itself, at some point, they all landed on the final design of an enclosed booth, a curtain, a simple camera, and excellent quality photo prints. 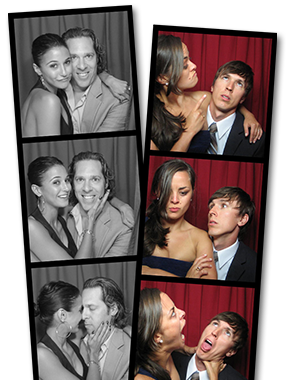 As we receive many inquiries for different types of photo booths, our approach is pretty much the same. Keep it simple, and keep it timeless. Our vintage, classic photo booth has a minimalist design, classic construction, with excellent camera technology ideal for “attention-to-detail” weddings in Newport (Castle Hill Inn, Ocean Cliff, Belle Mer), Bristol (Linden Place, Blithewold Mansion), Providence (The Biltmore), or anywhere else in Rhode Island where people are getting married. While innovation remains key for any business model, in this age of instant technology, finding an updated, yet vintage design can set your event apart. We find that ourphoto booth bridges generational gaps, appealing to both the old-fashion, pre-internet generation and the tech-savvy generations as well. 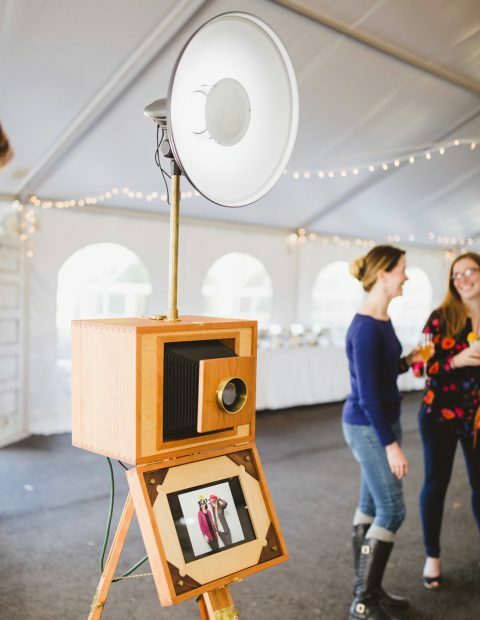 As you research your photo booth options, we highly recommend our classic photo booth – simple, elegant, timeless.